As we roll into Fall and Winter, it's a good idea to have a little extra protection for your camera bag. If yours doesn't include an All Weather cover, you can easily convert a Reusable Shopping Tote into an emergency rain cover. They look good. Yes, I could tie a plastic grocery bag over my gear, but that's not really the way I want to walk around the city. They stuff into a compact pouch that's easily stored in my camera bag, or hook to the outside with a D-ring. They're multifunctional. Yes, if I find myself in a store and need a good looking shopping bag, I have one. 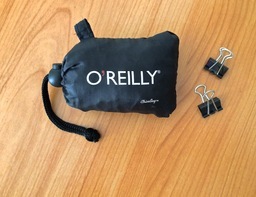 I carry a few office clips (also handy for other uses) and stretch the reusable tote over the top of the camera bag, clipping it at the bottom on both sides. 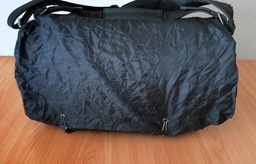 This protects the main compartment of the bag from the top, front, and back. I can attach it quickly, then stuff it back into its pouch when no longer needed. The reusable tote has a high Nimbleosity Rating. What does that mean? You can learn about Nimbleosity and more by visiting TheNimblePhotographer.com.